Varaha Jayanti is the birth celebration of the third incarnation of Lord Vishnu. He incarnated himself as a boar to save the world and held Earth on the two tusks from under the ocean. This day is observed and rituals take place on the second day (Dwadashi tithi) of the month of Magh (by the Hindu calendar) in Shukla Paksha. All the different incarnations of Lord Vishnu are celebrated as festivals in different parts of India to receive blessings from the preserver of the Universe according to the Hindu mythology. It is believed that worshipping Lord Varaha brings all kinds of happiness to the devotee including health and wealth. Half boar half-human Varaha had defeated Hiranyaksha and destroyed all evils. Thus, devotees worship him and pray for goodness to prevail. The Varaha avatar starts with the Doorkeepers of Lord Vishnu. Lord Vishnu lived in Vaikunta. His home was guarded by two gatekeepers – Jaya and Vijaya. As they were standing guard, the two of them saw four children come towards Vaikunta. They were the children of Lord Brahma. Their entry to Vaikunta was refused by these two gatekeepers. Brahma’s sons cursed Jaya and Vijaya to be born on earth as asuras (demons) in their next life. They are born on earth as Hiranyaksha and Hiranyakashipu or Hiranyakashyap to the sage Kashyapa and his wife Diti. The elder brother Hiranyaksha practises tapas (austerities) and is blessed by Brahma with a boon that makes him indestructible by any animal or human. He and his brother torment the inhabitants of earth as well as the gods and engage in war with the latter. When Hiranyaksha asked Narada if anyone was more powerful than him, Narada mentioned the name of Lord Vishnu. In order to seek Vishnu’s attention and confront him, Hiranyaksha stole the earth and took it to Rasaatal Loka. When all the Gods pleaded Vishnu for help, he incarnated as Varaha. In the ocean, A furious battle ensued between Hiranyaksha and Varaha in Pataal Loka which lasted for a thousand years. Varaha rises from the ocean with the earth in his tusks and places her gently above it in her original position, as the gods and the sages sing Varaha’s praises. Thus Varaha was able to save Earth and restore Dharma in the Universe. It can be perceived as the ultimate victory of good over the forces of evil. Sri Vadiraja is explaining the manifestation of Sri Varaha (boar form). Sri Varaha is shining like a black (dark) clouds full of water in the sky. He has the quality of sacredness. He is wearing a body which is equal to a huge mountain. Previously, when demon called Adi Hiranyaksha took (theft) away by his lila (bad play) the ocean, rivers, mountains and whole earth like a folded mat (chape), Sri Hari killed (destroyed) him like a fire igniting to the forest (heap) of cotton destroying (burning) by a fraction of a second. Sri Varaha has used water (ocean) as his play ground (jala kr^ide). When he lifted the earth from his pointed tooth (kore hallu), with the black portion of the earth and his white pointed tooth were looking like decorated black water-lily (naidele) flowers. The earth (bhoomi devataa) has used Sri Varaha’s thigh portion as her roaming (viraha) place. The god men (saints, yogi’s) who does continuous penance and austerity in forests and who eats roots and bulbous roots are saluting to him and they are happy & pleased by doing the same. The same Sri Varaha is being saluted by Sri Vadiraja in this verse. In the Vishnu Purana, Varaha represents yajna (sacrifice), as the eternal upholder of the earth. Symbolism also attributes that evolution from water could relate to the geological phenomenon of the tectonic age. It could also represent the rescue of earth from “false cults”. It is said that Lord BhooVaraha has to be prayed and worshipped to get rid all problem related to land and house. With the blessings of Lord Bhoovaraha, devotee may lead a peaceful life. May Lord Bhoovaraha bless all of us with a peaceful home to continue our sadhana in the right path. Sri Varaha Jayanthi is believed to be the day when Lord Vishnu appeared on earth in the incarnation or avatar of Varaha – the Boar Varaha is the third incarnation of Lord Vishnu. 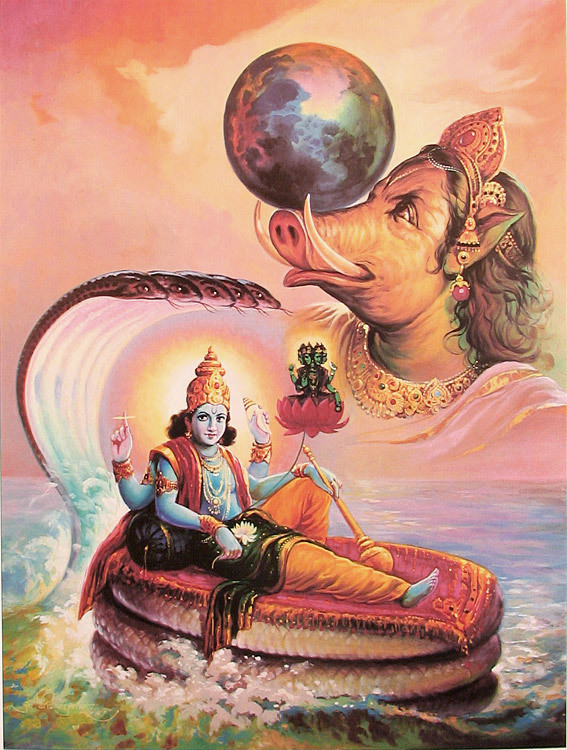 As per Hindu scriptures, Lord Narayana took the form of the Varaha to rescue Earth from Demon Hiranyaksha who dragged the earth to the bottom of the sea. Symbolically, the dragging of the earth by demon Hiranyaksha is Tamas (Evil) overcoming human beings. Bloated with ego, man falls deep into misery. The only saving grace is that of self realization. When it happens we slowly move out of deep dark pit – that is symbolically represented by Varaha uplifting the earth with his tusks.